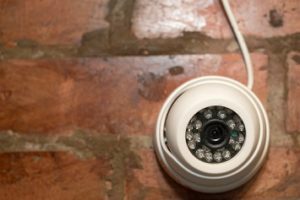 Using video surveillance for “Service Efficiency” improves business operations and brings a return on investment well after the initial purchase of the system. Spinner’s Pizza is a great example of how applying video surveillance technology can achieve positive results for businesses. Cameras previously installed for security by Holmes Security are now helping Spinner’s Pizza in Fayetteville, NC, improve staff efficiency while satisfying the appetites of hungry customers. Established in 1999, Spinner’s Pizza is a popular restaurant owned by Spero Poulos. With a dedicated following and a very busy lunch crowd, Poulos thought of using a “Pizza Cam” to streamline operations during the restaurant’s busiest times. “Holmes Security had installed Hikvision cameras for security in and around the restaurant. We decided, why not use it for the service efficiency and accuracy?” said Poulos. Spinner’s analogue and IP hybrid system includes mini domes, bullets, and turret cameras. Holmes Security recommended and installed the Hikvision DS-2CE56D5T 1080p Turbo HD-TVI Turret camera for the buffet to deliver HD quality over the existing coax cabling. Holmes Security positioned the turret camera to the upper right of the buffet to capture the entire line of pizzas. Spinner’s kitchen staff can now see the buffet from a monitor in the kitchen allowing the chefs to stay ahead of customer demand. “We’re able to keep the buffet full at all times. When someone is on a tight lunch break the last thing you want them to do is wait for food. With the Hikvision camera in place, they no longer have to,” said Poulos. The Pizza Cam enables the operation to be run from the kitchen monitor with no downtime. The combination of a camera with a kitchen monitor keeps the staff from running to the buffet just to check what needs to be replenished, Poulos noted. “Heat tolerance was a big consideration based on the camera’s position in relation to the buffet itself. The specs showed that the Hikvision camera’s operating temperature range was -22° to 140° Fahrenheit, so we knew it could withstand the heat,” Dave Foster, sales and marketing manager for Holmes Security, a 109-year old, family-owned security company based in Fayetteville, NC. According to Poulos, he gets comments all the time about what a great idea it is. “The customers especially like the fact that they don’t have to wait for new pizzas to be placed on the buffet,” he added. In a multiyear, multistage project, Midwest Foods, one of the largest North American food distributors, has been converting its hybrid security system from analogue to IP with the help of Illinois-based integrator Imperial Surveillance to run a safer workplace. Imperial Surveillance began working with Midwest Food’s main facility in Cicero, IL, 3 years ago, according to Garrett LeTourneau, cofounder and CEO of Imperial Surveillance, originally installing Hikvision IP cameras in key locations to support a legacy analogue system with the new IP cameras. Now a recent upgrade by Imperial Surveillance is moving Midwest Foods to higher levels of IP technology. LeTourneau and his team installed more than 20 of Hikvision’s DS-2CD2342WD-I Network Turret Cameras and additional eight-channel NVRs. The cameras are sealed to withstand environmental conditions from the processing lines. The HD video quality of the new system provides a more effective way of monitoring food safety concerns. Midwest Foods is finding that overall, continuing video surveillance expansion has helped the company run a safer and more efficient production floor and operation.